Welcome to the Salisbury, Pennsylvania Historical Web Site. From the Cornplanter Indians to early settlers, through plague and disaster, to its war heroes and sports exploits, discover the charm of this southwestern Pennsylvania town. Chapter by chapter, delve into the history of Salisbury's schools, bands, sports, churches, groups, military, disasters, street scenes, industries, first inhabitants (Native American and early settlers), and nearby communities. And for the genealogist there is also a chapter on the Showalter Family history. You'll find it easy to page through the history of Salisbury simply by clicking on the icon bar at the bottom of each page. 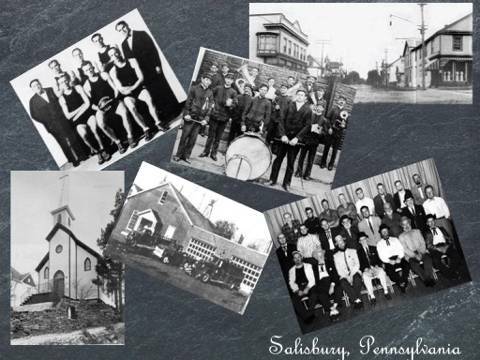 While you're here be sure to check out the other pages related to the story of Salisbury.Reminisce about the "good ole days" at the Salisbury - Elk Lick High School alumni pages! Have a comment about the web site or looking for information? Leave a note for me in the guest book. I hope you enjoy your visit.